Johannes Gutenberg created a mechanical printing process in the 1400s using movable type. This allowed for flexibility in printing or copying. Now, digital printing technology allows for printing from digital images and uses no printing plates. Beginning in 1990s, complex and expensive printers, such as the Iris 3047 made by the Iris Graphics, Inc., company, allowed business professionals to print digital graphics arts proofs using water-based cyan, magenta, yellow and black inks. As camera companies, such as Kodak, Nikon and Canon, began to offer low-cost and easy-to-use digital cameras for both personal and business use, the popularity of digital printing increased. Digital printing requires no darkroom or processing chemicals, making it accessible to anyone with basic computer skills. Instead of sending negatives to labs for development, both amateur and professional photographers started to print all their photos at home. Graphics artists started to use image editing software tools, such as Adobe Photoshop, to adjust images, including contrast, shape and saturation. In 1996, Epson introduced the first inkjet printer that could produce photo-quality prints from a desktop computer. 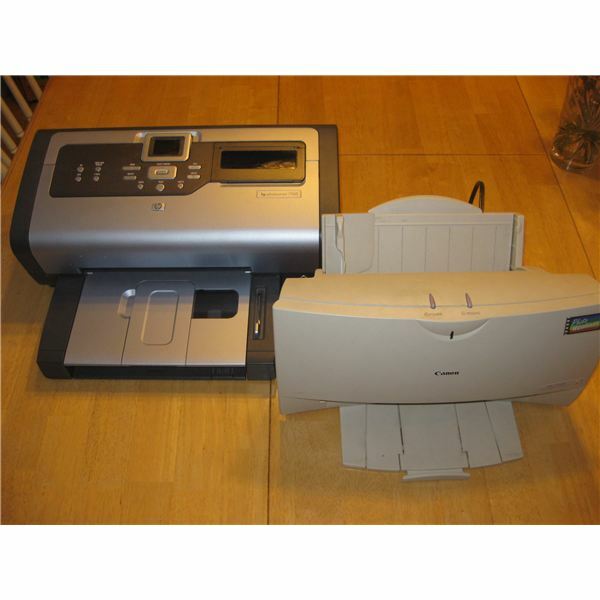 Hewlett-Packard introduced its Photosmart printer in 1997. The following year, HP began selling its first pigmented inkjet color printers, the DesignJet 2500 and 3500 series. Pigment inks are more light stable than dye-based inks and therefore are more fade resistant. Digital printing became a viable alternative to traditional reproduction technologies, such as screen printing or lithography. The Epson Stylus Pro 7500 pigmented printer introduced in 2000 could handle very thick paper, making it popular in the fine art printing business. In 2003, the HP DeskJet 5550 allowed users to print with up to six inks and utilized 4,800-optimized dots-per-inch technology. In 2004, Epson introduce clear gloss-optimizer ink, allowing for usage of a wider range of photo paper. In 2006, Canon introduced a 12-ink inkjet printer. In 2009, HP introduced the HP Photosmart Premium with TouchSmart Web that enables users to print from the web using just a printer. For example, people could then search for, buy and print movie tickets from their home. Offset-quality digital press solutions continue to evolve to support the needs of personalized digital business communication. Companies continue to perfect the processes required to produce water-resistant photos that instantly dry right off the printer. Features such as smear-free and smudge-resistant printing allow business professionals and home users to print less, which is better for the environment. Companies research methods to produce ink, media and printer systems that produce high quality output that lasts. Digital printing allows both home and business users to print digital images from desktop computer systems. Improved easy-of-use and quality have made digital printing popular. Over the last twenty years, digital printers have improved and expanded the number and type of inks supported, replacing silver-halide color photography printing. In the future, assuring the permanence of copies produced should make digital printing even more attractive. "HP History : 2000s." HP® – Laptops, Desktops, Printers, Servers and more. https://www.hp.com/hpinfo/abouthp/histnfacts/timeline/hist_00s.html (accessed January 18, 2011). "Wilhelm Imaging Research." Wilhelm Imaging Research. https://www.wilhelm-research.com/ (accessed January 18, 2011).